911uk.com - Porsche Forum : View topic - New car...! And first post. 911uk.com Forum Index > 991 (2011 - current) > New car...! And first post. Posted: Fri Mar 23, 2018 4:11 pm Post subject: New car...! And first post. So, I've had my new GTS for 3 weeks now but due to work and the inclement weather I haven't driven it much.......until Wednesday, when I had a spin down to the South coast. The weather was lovely and sunny if a bit cool, so caution was the order of the day in the shady spots. In fact there was still snow drifts restricting a few of the smaller roads on the coast! As the trip progressed it was fantastic to get a better feel for the car and the confidence to grow. It really is a great drive, a revelation in fact and the steering feel and ride is better than I recall any previous cars (new car-itis perhaps...? I think not) I've owned. I'm really really pleased with the colour, although I know Miami blue can be a bit marmite. The interior is a lovely place to be, I'm glad I ticked more boxes than I should have, with the 18 way, leather backed seats just about perfect for me. It's too early to really comment on the RWS and performance-wise, as I'm running it in I didn't go mad with the revs but everything seemed fine. I changed my order quite late in the day from manual to PDK after my PEC day and I'm not disappointed. The collection went well but I was disappointed with the standard of the paint finish but fortunately I had it booked in for a new car detail and ceramic coating. 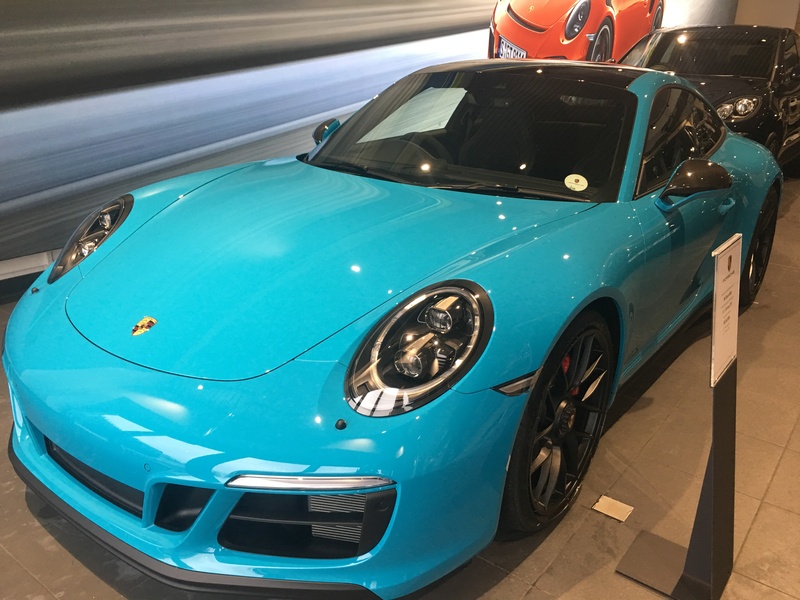 The noise is great albeit not as loud as I recall previous iterations of 911's but more than loud enough for me, maybe the colour makes up for the noise a bit...... I was concerned that I would receive a fair amount of negativity driving a 911 but I have found the opposite so far if I'm honest. Lots of thumbs up, waves and grins from other drivers and plenty of small children pointing, waving and shouting. When I got back home I was buzzing and would of happily gone out again for a few hours. The urge to just go and drive the thing is huge at the moment, I'm especially looking forward to some warm dry summer evenings. It's my first Porsche and I'm no driving god but it's a huge step up from what I have been driving recently. First impressions have exceeded what I thought it would be like, so it gets a 9.95/10 from me. You're a happy bunny. Welcome to the club. Thanks for the kind words and yep, I'm one very happy bunny. It's my present to myself for managing to survive for 50 years on this blue lump of rock we call home. I have been lurking on here for a while so I thought I'd sign up and say good day. If your runs to the coast bring you Bournemouth way , let me know and happy to grab a coffee and sandwich . lookforward to seeing at one of the meets maybe simply Porsche in the new forest . 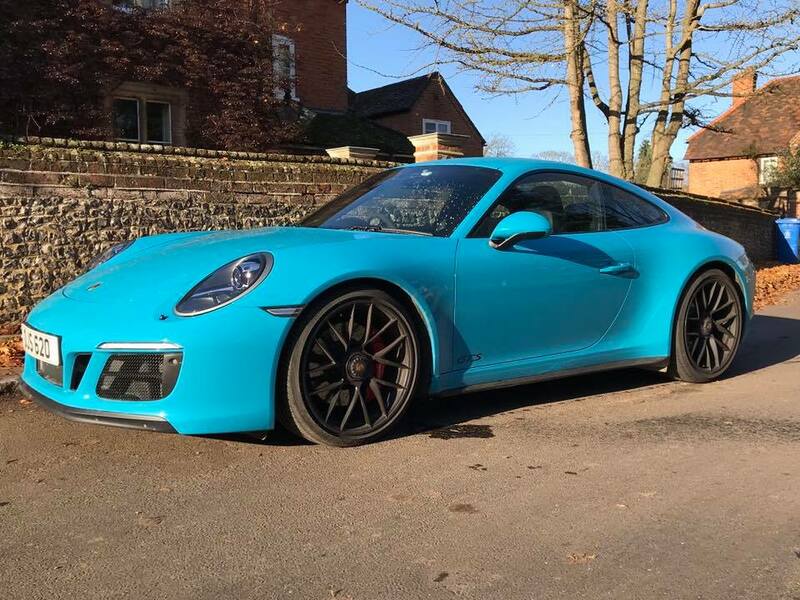 Congrats on the new purchase, stunning colour, and welcome to 911uk. I'm a massive fan of bright colours on 911s. Miami blue is stunning. I hope I can buy myself something even half as good for my 50th. Not a bad 911 for your first one. Tell us more about your previous cars and how this one compares. Posted: Fri Mar 23, 2018 6:33 pm Post subject: Re: New car...! And first post. The collection went well but I was disappointed with the standard of the paint finish but fortunately I had it booked in for a new car detail and ceramic coating. Welcome to the Forum and many congratulations on the new car. It looks absolutely gorgeous. Have noticed in my local OPC that the paintwork on many brand new cars is less that perfect under the bright lights of the showroom. My own car when it was new 4 years ago had a full paint correction and GTechniq ceramic applied. Still looks as good as new. Thank you all for the welcome and kind words. My coast run usually ends at Worth Matravers (I'm sure you know the Square & Compass!) so Bournemouth is not far away. I'll take a look at the New Forest meet. I never thought I'd reach 50, never mind get a new P car too! My DD is a T5 Kombi and its great for dogs, bikes and work. Previous car was a C43 coupe. It was surprisingly quick, a very nice place to be but felt very heavy. All sorts of hot hatches but my standout car was a S2000 that I bought new in 2003. Cracking car and nothing has come close since but I've always wanted 911. I see the 911 as my evolution of the S2000 so that's where my comparisons will be. I went down the GTechniq route too. Happy so far. When I'm in my local OPC I notice the paintwork on the pre-owned cars seems better than the new cars half the time. Lovely car, great intro to the Porsche brand with a "new" GT3, it took me until 60 to buy my five year old C4S.....never looked back. It's too early to really comment on the RWS and performance-wise, as I'm running it in I didn't go mad with the revs but everything seemed fine. The urge to just go and drive the thing is huge at the moment, I'm especially looking forward to some warm dry summer evenings. I’ve had my GTS for nearly a year now and still feel the same way. I got it for very similar reasons and have no regrets. Modern cars are just so good. I know that I’m interacting with loads of computers when I drive it but it doesn’t *feel* that way. Everything is so well matched and integrated and it’s pure joy to thread it down a gnarly B-road: it just seems natural, not forced.